Yes Please telephone or email us to confirm your complimentary consultation to discuss your specific requirements for your unforgettable day. 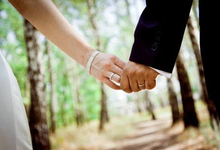 We look forward to assisting you and your partner to develop and deliver your day - your way - with out fuss. 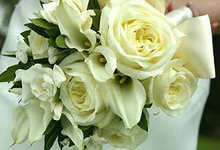 For a full planning service it's advisable to make contact as soon as your engagement is announced - for a Wedding Day Coordination Service or the Day of Coordination Service we suggest at least 8 weeks prior to the wedding day as the DOC usually commences work for the bride and grooms big day at least 3 weeks before to ensure the venues and suppliers contract details are in train and will seamlessly be delivered on their unforgettable day. 8- 10 hours with option to extend by an agreed hourly rate. No However we can provide for experienced interpreters to ensure communication is both accurate and culturally sensitive . Yes Details advised on application . 25% on contract signing with progress payments during a full planning contract engagement. At LUXE – Unforgettable Events our wedding planning, coordination and event management experience together with service provision is distinctive, diverse and detailed. 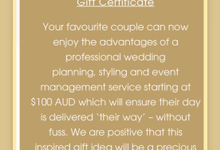 Yes, our packages at LUXE can include wedding styling if you so choose too to ensure that your specific theme and style for your unforgettable day is at the corner stone of all primary and allied vendor/ supplier contracts from the outset - the earlier your style and concept is factored into the budget and planning, the better. Our LUXE packages are designed with you – just for you and your unique event. It’s a very practical and affordable way for you to manage your event from start to finish and the ‘On the Day of Coordination Service' too. 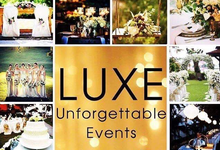 Each event designed by LUXE – Unforgettable Events is as unique as you are. 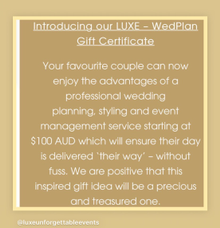 Our wedding planning and event services at LUXE includes expertise across event design, production, venue and supplier relationship development, creative and pricing negotiation, contractual arrangements, copywriting for speeches and protocol advice, printed and digital promotional material, logistics, budgeting,on the day run sheets and full coordination for venues and event personnel which ensures a superior client service experience and outcome. At LUXE we also offer "Consulting Services” which are one-on-one sessions to help get you started with minimal time and financial commitment that provides you with professional advice and helps you stay on track. One to two hour sessions, at an agreed hourly rate, whenever you need support or a debrief during your planning process. This type of support service is to help you brainstorm, define your style and vision, decide on the best course of action and what steps to prioritise in a logical and practical sequence. Personal recognition by professional peer groups for Event Management, Creative Development and Brand /Campaign Positioning has been evidenced by the receipt of industry recognition awards including several, Gold, Silver and Bronze Awards for Annual Reports , Best Event Campaigns,and Best Hotel Marketing Campaigns. 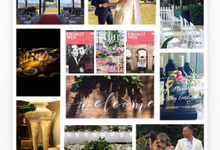 LUXE – Unforgettable Events is a personalised bespoke wedding planning, styling, on the day coordination and event specialist service based in Sydney. 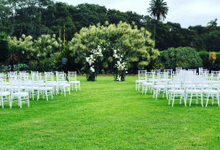 We specialise in Wedding Planning, Styling, On the Day Coordination, Celebrations and Special Events end to end - where ever your preferred location may be. Our distinctive service caters to you and “your day – your way - without fuss”. Email or telephone us today for our LUXE-WedPlan Package options - something for everyone and every budget.